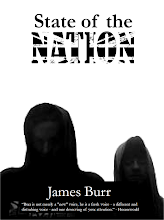 James Burr: I'm going to start writing "State of the Nation" this Summer. I'm going to start writing "State of the Nation" this Summer. I actually have a whole 4 months off this Summer which means I'll be able to break the back of the new collection, "State of the Nation." "Shooting Stars" is already finished and is currently being previewed on this blog. "Dawn of the Brain Dead", a 20000 word novella which I originally wrote in the summer of 2007 (before then losing the lot thanks to Bill gates' inability to create an operating system that actually works and isn't riddled with bugs), will be rewritten. (After the bowel-clenching grief of losing it I finally feel ready to get going on it again). It will also include two other stories / novellas which I don't even want to mention lest the titles give anything away. While I hope to get all the first drafts done this Summer, there will undoubtedly be my usual period of revision and rewrites, so expect to see it some time in 2010. The novel, "Razor Moccasins", is still ongoing.